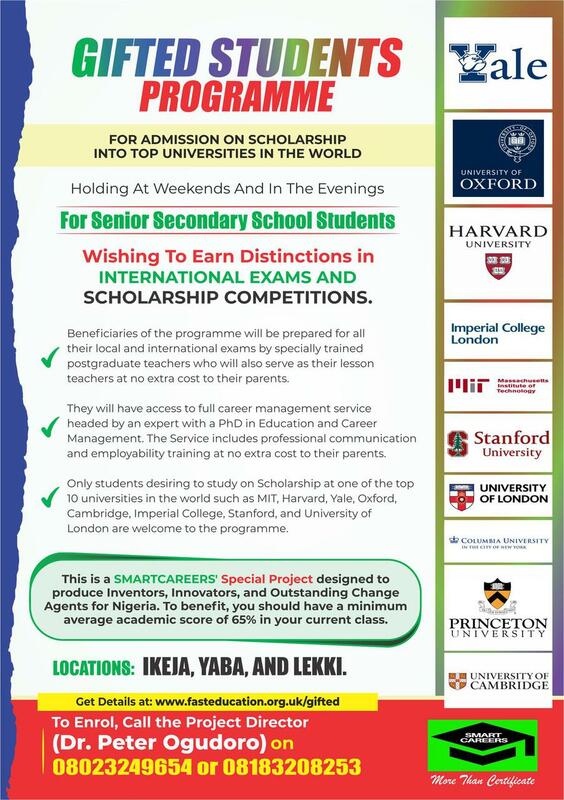 FOR SENIOR SECONDARY SCHOOL STUDENTS WHO DESIRE TO FINISH SECONDARY SCHOOL AHEAD OF THEIR PEERS AND STUDY IN ONE OF THE TOP TEN UNIVERSITIES IN THE WORLD ON SCHOLARSHIP. THE SPECIAL TRAINING IS AVAILABLE AT WEEKENDS AND EVENINGS BEGINNING FROM SATURDAY, April 27, 2019. 1. Preparation for Social Grace and Excellent Communication Ability. 2. Full Career Management Service headed by an expert with a PhD in Education & Career Management. 3. Employability Training & work placement for interested students and processing of university admission application at no extra to beneficiaries’ parents. 4. Students’ exposure to Leading Education Scholars from around the world who volunteer for the success of the programme. 5. Preparation for all relevant local and international examinations by specially trained postgraduate teachers who will serve as the lesson teachers of the beneficiaries at no extra cost to their parents. 6. Beneficiaries will secure all the academic credentials they need for university education in the USA or UK far ahead of their peers and groomed for Global Citizenship. This will save them time, give them clear advantage, and save their parents money. 7. Opportunity for participation in sponsored international exchange programmes and summer schools in the USA. G. INTERNATIONAL SCHOLARSHIP & SUMMER SCHOOL COMPETITIONS. The same fee covers your preparation for all the exams. To be accepted, a minimum grade point average of 65% in current class is required. This is a comprehensive career service that includes preparation for relevant international examinations. It does not stop at that. Its major aim is to help the beneficiaries navigate getting into an ivy university on scholarship with ease so they can save their parents money and start their career journey from a position of advantage. A Career Management Expert with a PhD in the discipline who received his training in 12 research-intensive higher educational institutions around the world including Oxford and Cambridge Universities is the Project Director. This amazing programme will make beneficial academic demands on the students who must be self-motivated to be accepted. The affordable fee their parents will pay for them to benefit from the programme if accepted is not up to 1% of the value of the scholarship they will secure as a result of their participation in the programme. Financial aid for the career service is available for very bright candidates from financially constrained homes. Call Dr Peter Ogudoro on 08023249654 if you need any special help. Weekends. On Saturdays, classes start at 10am and end at 4pm. On Sundays, classes start at 1pm and end at 5.30pm. Regular breaks are observed for refreshment and lunch. Week days are included during school holidays at no extra charge. Evening lessons are available for students who are ambitious and willing to go the extra mile for outstanding academic performance. Free Sceening- Call 08023249654 or 08183208253 for a screening appointment. AutoPointe Quick Fix, 102 Ogunnusi Road (Ile Epo Bus Stop- after Grammar School Bus Stop if you are coming from Ogba), Ojodu-Berger, Lagos. This location is sandwiched by Cake & Cream, and Stanbic IBTC, Access Bank, and Tantalizers. Call 08023249654 or 08183208253 (Dr. Peter Ogudoro) to get an appointment.